As the Chicagoland Vampires series comes closer to its big finale, the excitement is reaching an almost unbearable level. 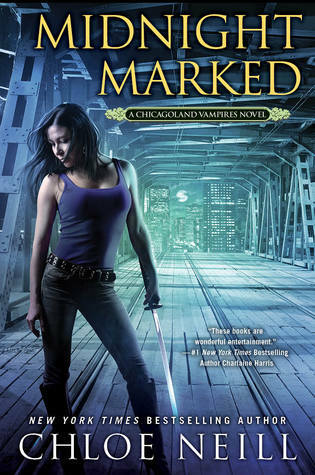 Midnight Marked, the penultimate book in this excellent, beloved series, brings just a tiny bit more of everything: more romance, more action, more friendships, more enemies, and more danger than ever before. Ethan and Merit are still right in the middle of a supernatural war, and as they fight prejudice, misunderstandings, and outright malice coming from all sides, they somehow always come out on top and learn alongside each other. At this point, they are a well established couple, comfortable around each other though not always harmonious, and it’s good to see them growing stronger and finally working together. I always mention the timeline of this series because it makes me somewhat uncomfortable. I would have preferred a much longer period between the events of the first book and now. Only a year has passed since Merit has become a vampire, and considering everything that’s happened to her, I have a hard time believing everything from her character development to her romance with Ethan. It’s just too much for such a short time – the intensity of their emotions would have been far more credible had they been given enough time to develop. As it is, they jump from one supernatural battle to the next, twelve total at this point, and they still have time for friendships, prophecies, resurrections and forgiveness. Merit is finally learning to accept her family, flaws and all, and perhaps even making peace with the fact that they are who they are and that they’re highly unlikely to change. I love that this aspect of her life isn’t at all black and white, that her father has horrible flaws as well as redeeming qualities. It adds an extra layer to her character and brings complexity to her actions that otherwise wouldn’t exist. Ethan, for his part, remains the stubborn, high handed, secretive idiot, but I find that oddly comforting. Having him change his ways in asingle year after 400 years of existence would have been almost ridiculous. As it is, he infuriates me, but I understand, and the tiny improvements I notice make me absurdly happy. I’m already dreading the goodbye that’s ahead of me. I’ve spent so much time with these guys, learned to love them and even despise them at times (Ethan, ahem), and I already know I’ll miss them like crazy. But let’s not borrow trouble or grief. There’s the big finale ahead of us and I just know it’s going to be spectacular. I've seen so many great reviews for this already and I love it. I love it when a series can be this far in and still be going strong. I haven't thought about picking up this series in a really long time but I think I'm ready to start another epic UF series, not to mention re-join the world of vampires. Thanks for putting this back on my radar, Maja--I'm so glad this series hasn't disappointed! so many books! I'm late! so late! I have the 3 first books in French but I need to get into them! I simply adore this series and like you said given how much as happened, I always have a hard time realizing that only one year has passed!! O_o Darth Sullivan has changed enough to be more Ethan than dark side, but he still has his moments! Cannot wait for the next book!! Glad you liked this one, but I grew disenchanted with this series after book 4 and I could never rekindle my ardent love for this series as I did with the first few books. I still haven't picked this series back up. I think I was put off after the whole book five debacle. Still now that it is nearing the end, I want to finish it. I really miss you on the blog. Come back soon! This is one of those series that I never really developed any hankering for. I'm glad you're still excited for the installment despite it nearing its end.